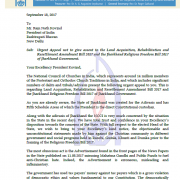 The National Council of Churches in India (NCCI), the apex body of the Protestant and Orthodox Churches which represents 14 million people around the country registers its protest against the irresponsible use of press freedom. The Times of India and Dainik Bhaskar (Nagpur | 11-11-2014) printed some speculative claim made by a scholar about Jesus and Mary that has caused immense grief to the Christian community at large. In a pluralistic context of India where not only freedom, but also respect for all religions and religious sentiments is both taught and practiced, such insensitivity on the part of the publishers is intolerable. While we respect and support the freedom of press, surely it must be used responsibly. 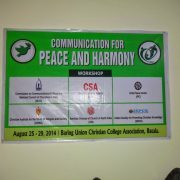 It may be seen as an irresponsible act purported to incite the feelings of the Christian community. Such provocation must cease in the interest of upholding the cherished secular fabric and principles of love and unity that our Country proudly professes to have had since ages and indeed does. 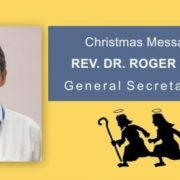 Christians, although a minority community, have been in the forefront of care-giving missions, education and service in society, contributing selflessly to the cause of nation-building and promoting values of peace, unity, love and justice. No community in our country should be subjected to such provocation, mockery or emotional violence. Such actions by someone from a structure so sacrosanct as the fourth pillar of democracy, causes not only grief and the pain of being wronged, but also threatens the basic sense of security of the minority, and thus vulnerable, communities such as the Christians in India. NCCI demands that immediate and strict measures be taken to investigate this matter and ensure that such instances do not recur. 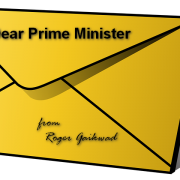 The publishers must accept that the sentiments of a religious community have been hurt, and must tender an apology. 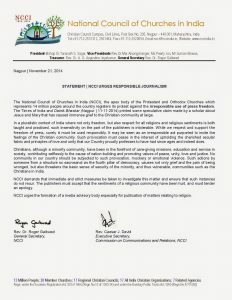 NCCI urges the formation of a media advisory body especially for publication of matters relating to religion.